Listening to a little boy singing about farts. And santa, who is mad, apparently. While the other boy makes accompanying rude noises with his dinner mouth, despite the fact he's supposed to be eating pasta and broccoli. One of these boys lost his pants up a tree, after he stripped them off to jump into the ocean and then became flummoxed that no towel instantly appeared when he emerged, sopping and gleeful. "Did you bring one?" I ask him? He shakes his head no. "Well, maybe next time you will," I shrug, then chase him with a hermit crab. Being around boys, with this energy and constant movement and sparkle of spirit, it's been fun for me. Kate's boys are the kind of people you want to spend your days with, asking deep questions and listening to their awesomely insightful or disdainfully flippant responses. "Do I want to talk with you about this?" their eyes ponder. You never know which way it'll go. But oh, it'll be good no matter which way they respond. They offer up their tiny nuggets of brilliance and then return to fart jokes and wiggly bodies, giggles and overwhelming brightness. They make fast friends, these boys, and are in your lap and tickling before they realize they forgot your name. On the drive to the airport this morning, we talked about how very different little boys are from little girls. I used to believe that concept was a gender construct and with some, it absolutely is. But in general, boys seem to be a bundle of sound and movement and chaos, flinging their backpacks and jackets to the ground as they run from the bus, zippers down to pee on a tree. A perfectly organized and clean home can become homey and disheveled within minutes of arrival. It's exhausting. And achingly beautiful. Watching those boys bundle off to the school bus in a rush, sleepy eyed and gripping lunch bags, running to make it in time... they are all the things. I'm going to miss this crazy, lovely land. 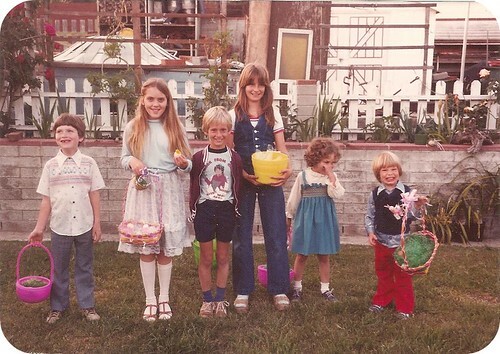 My brother, some cousins and me, circe 1980 (ish). 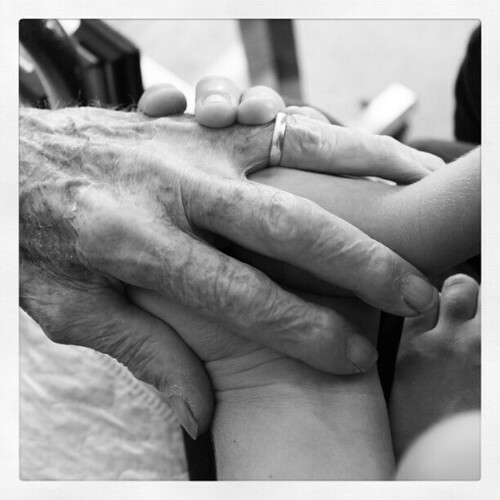 My Grandfather died November 18th, a little over a week after I last wrote here. His death was one surrounded by friends and family and in his own home, knowing he was loved, cherished and cared for deeply and totally. If you ask me, it's kind of the perfect way to go. Last time I bothered to write, it was about the impending loss of my Grandmother, which hasn't happened yet. She's holding steady. The last couple times I saw her, though, I couldn't understand her speech, she didn't appear to have any idea who I was and spent most of the time I was there agitated. The girls have no idea how to be with her and honestly, I don't either. I have never been any good at sitting still. I have to be talking and doing all the damn time and with her, that's not always the way to be. Clearly it's a skill I should learn. But it's my Grandfather I really came to write about today. I find myself at the edge of another emotional precipice. This one is spelled "Alzheimer's". For me, it's only a shallow fissure, running up and down the map of my skin, parts crumbling painfully while other sections are almost imperceptible. I see it more clearly in my Aunt, the Designated Power of Attorney, or the DPOA as they sometimes refer to her at the care facility. She is heavy in this. She carries a binder so dense it has its own gravity, within it every medical decision, note, symptom and complaint for both of them, going back to 2006. "Someday," she tells me, "You'll have to make a binder like this for your parents." Last week I called my BFF who lives in San Francisco and told her that I had five days of no shows at the theatre and had been fantasizing about flying up to the Bay Area to see her. "I don't have the funds, though, so it's not going to happen." "Wouldn't have been a good idea anyway. I'm working in LA this week." She replied. "You're what? That's only two hours away?" "Yep." I could hear the grin in her voice. "Let me make a couple calls." 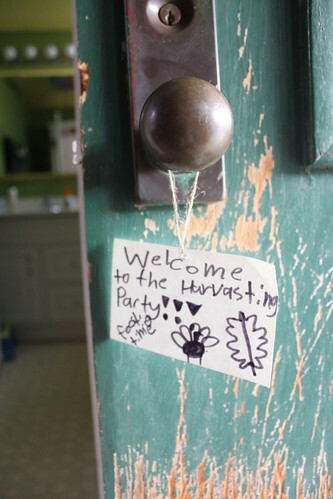 We had our annual Harvest Party last weekend and this time, I didn't live blog it like I have in the past. Instead, I live Facebooked it. Because I'm awesome. But I did want to share the time-line here as I've discovered that when you only do something once a year, you totally forget how. EVERY SINGLE YEAR. And that's where this here blog gets useful. Also, I'm trying to blog more. Win-win. 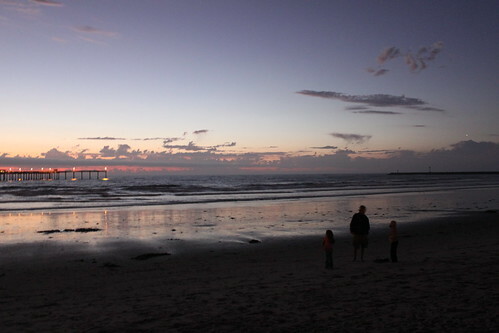 On Friday, we attempted to catch ourselves a sight of bioluminescence with a night time trip to the beach. Despite the fact that I grew up in a beach town, I've never seen lingulodinium polyedrum, the specific type of dinoflagellate that can turn the ocean into a shimmering, glowing blue. From what I understand, it's a totally different phenomenon than red tide, which is caused by an algal bloom and can be seen anytime of the day, not just in the dark. Of course, everyone seems to be referring to it as the red tide, but they are wrong (as was i until I was educated by my Mister... and then Wikipedia). Unfortunately, we couldn't see it. Not enough happening and with the chill in the air and my kids being freaked out by being OUTSIDE! at NIGHT! at the BEACH! GAH! well, we didn't stay long. 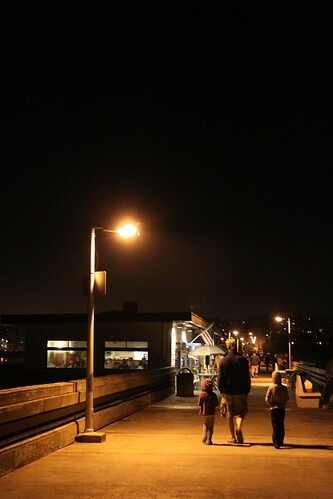 We went for a walk on the pier, hoping to not let the night go to total waste with the crabby kids that kept following us around. On the way back to the car, we noticed a large group of people on the shore having one hell of a good time with fire dancers and whatnot. One of them released a paper lantern, letting the candle inside turn it into a mini hot air balloon as it sailed out over the water. In general, I think that's a bad idea... it's pretty yes, but it's ultimately littering. Keep it on a string and I'll approve. But it offered another chance for us to go all science geek on the kids, explaining how hot air rises, lifting the lantern into the sky. Lily was fascinated and the fella walking close by gave me a huge grin and complimented our discussion. Lily's been all about the science questions lately. In the car the other day, it was questions about lightening. And I find myself not always able to fully answer her questions. I remember learning all of that stuff (Cirriform, Stratiform, Cumuliform... what?) but can't seem to recall the details anymore. If not for the wonders of the internet, I feel I'd make a crappy parent. But maybe becoming parents allows us to relearn all the cool stuff. I haven't cared what the different forms of clouds are called in years. Now I want to know. I've had plenty of opportunities to see both a red tide and bioluminescence over my adult lifetime, but never really latched on until it was something to show them. Maybe this is one of the ways they make us better people, by making us decide to be smarter. How have the kids in your life made you a better human? And anyone want to recommend a couple good science websites for kids (and their curious adults)? I've been back from Burning Man for a week now and am still processing the event. I have never been so close to such amazing artistic expression, such a overwhelming explosion or immersed in such a group of love and grief. I shy from such a cliche word as "Epic" but it really does come closest to describing how the whole thing felt. You can experience Burning Man in so many ways that with the onslaught of input, the Mister and I found ourselves mostly staying close to camp. With one of the more open and welcoming camps on the Playa (or at least, that's how many described it) we enjoyed meeting people as they came to us and we fed them. After all, Camp Potluck was our name and provided a much needed break to many a weary burner. We also had the most amazing food, thanks to Ben. I have a lot to share about my visit to Black Rock City, but really, I am still processing it. For now, I want to share with you the photos that our campmate Erich took so you can get some idea of the scale of art available to you when you visit the Playa. Erich is an architect, photographer, artist, Dad to twin teens, old soul and, well, brilliant. Spending time with he and his Mary made the time at camp even more profound. And his photos took my breath away. Enjoy these for a bit and I'll come back later to share some of my own photos (of which there are shockingly few) and stories (of which there are shockingly many). In the meantime, I'll be collecting my thoughts. Or, at least, trying to. Hope you've had a good end of summer while I've been silent! 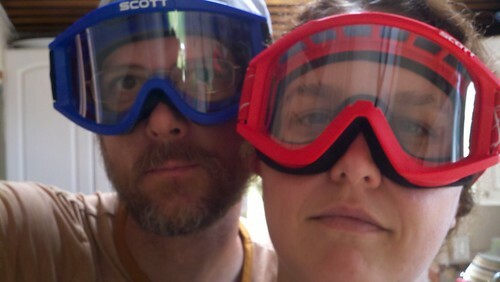 To read about our Burning Man prep from Ben's point of view, check out his blog here. I cannot even begin to describe how overwhelmed I am right now. It's better today, now that Mark and the girls have headed off to Grandma's house with 99% of the items we need to bring to Burning Man. I don't get to leave for another couple days as I have this pesky job that requires only a minimal amount of time off, especially during our busy summer season. But the delay is buying me a few days of quiet to prepare myself, get the last of my packing done (I need boots!) and for my own set of hand flapping stress release. Added bonus to going late: when my friend Sandy and I arrive on the Playa, our camp will have been lovingly set up by our Misters with drinks ready to serve and amazing food ready to eat.